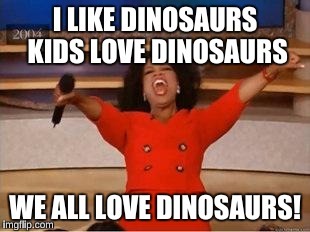 I love dinosaurs, kids love dinosaurs and you probably like dinosaurs. So when dinosaur books come out, I must get it! 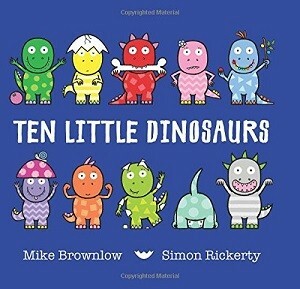 Ten Little Dinosaurs is a simple and familiar story of ten dinosaurs who go wandering around without their mother and get hopelessly lost. There are many picture books like this, one that comes to mind is 'Ten in a Bed' by Penny Dale. So what makes Ten Little Dinosaurs stand out? First off, I think one of the most important things in a picture book are pictures! They captivate the reader and draw them into the story and then, as the reader reads on, the pictures compliment and add to the story. These pictures are cute as. Not just the dinosaurs though, but everything else around. The kids in my class kept finding new things on every page and it was exciting to find them. I bet you already know the ending to this story, and that is why I am disappointed. I wish the ending was different! Help the kids learn about extinct, have mammals rise up and be the dominant species (which will lead to a sequel) or something that isn't predictable. Harsh yes, but dinosaurs are very dear to my heart. However, if you like these kinds of endings, or your child is very empathetic, then Ten Little Dinosaurs is perfect. As the pictures have so much detail, there is a lot of re-readability.